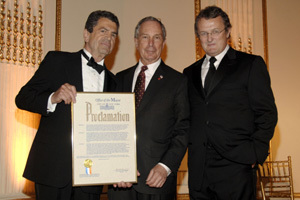 Phoenix House Founder Mitch Rosenthal, Mayor Michael R. Bloomberg, Phoenix House President and CEO Howard Meitiner. Photo by: Nick Hunt/patrickmcmullan.com. NEW YORK – Wyclef Jean, the Grammy Award-winning musician, producer, and humanitarian, will join Fireman Capital Partners Chairman and former Reebok CEO Paul Fireman, Dan Fireman, Shaquille O’Neal, Eli Manning, Michael Strahan, Rick Fox, and other stars from music, sports, and business to honor Lisa Ellis of Fireman Capital Partners and Carnival House Recordings. Ms. Ellis will receive the 2009 Phoenix Rising Award, to be presented by Phoenix House on March 30th, 2009. The annual Phoenix Rising Award Dinner will be held at The Plaza in New York to raise money for Phoenix House, one of the world’s leading non-profit drug and alcohol addiction, prevention, and treatment organizations. Past recipients include Russell Simmons, hip-hop artist and business mogul, and Jeff Zucker, President and CEO of NBC Universal. Ms. Ellis helped develop the careers of Prince, Beyoncé, The Fugees, Lauryn Hill, Wyclef Jean, John Legend, Nas, Destiny’s Child, Maxwell, Terrence Howard, and many others in her roles as Executive Vice President of Sony Music Label Group and President of Sony Urban Music. She and Wyclef Jean founded Carnival House to develop new music, publishing, and film projects. Ms. Ellis is also a Founding Operating Partner of Fireman Capital Partners. Miri Ben-Ari, the Israeli-born, classically-trained “Hip-Hop Violinist” and Grammy Award-winning songwriter will perform at the dinner, along with a special acoustic performance by Wyclef Jean and a taped tribute from Shaquille O’Neal. Ms. Ben-Ari’s collaborations with artists such as John Legend, Jay-Z, Kanye West, and Wyclef Jean have helped sell millions of records. Dinner Chairs are Paul Fireman, Chairman, and Dan Fireman, Managing Partner of Fireman Capital Partners. Co-Chairs are Rose Marie Bravo, former CEO of Burberry; Wyclef Jean, musician; Eli Manning, 2008 Super Bowl MVP and New York Giants Quarterback; Shaquille O’Neal, NBA “All-Star” Center for the Phoenix Suns, rapper, and actor; Richard Plepler, Co-President of HBO; Jeff Ross, Executive Producer of The Tonight Show with Conan O’Brien; and Andrew M. Spellman, Partner of Fireman Capital Partners. Other members of the Host Committee include Sarah Chapman, Rick Fox, Cristie Kerr and Erik Stevens, John Legend, David Lipman, Will McDonough, Shaun O’Hara, Shari Redstone, Aaron Sells, Robert Souza, Michael Strahan, Wes Welker, Gus Williams, and Josh Zeide. Phoenix House is one of the nation’s leading non-profit substance abuse prevention and treatment service organizations, serving close to 7,500 men, women (including women with children), and teens each day at more than 152 drug and alcohol treatment and prevention programs in 10 states – California, Connecticut, Florida, Maine, Massachusetts, New Hampshire, New York, Rhode Island, Texas, and Vermont. For information visit http://www.phoenixhouse.org/. For information on ticket sales, please contact Stacy Johnson at 212-997-0100.